It's the pick of the Volkswagen crop and - finally - it's headed to Australia. After much thumb twiddling, VW importers TKM Automotive has finally taken the decision to introduce the vehicle which has been acclaimed as the best small car in the world, the Polo, to the local market. Australia will get its first look at the pretty and practical Polo at the Sydney Motor Show in October, with the car going on sale some time in November. However, while the Aussie public has to wait a few more weeks for a peek at the Polo, some people just couldn't wait to see what all the fuss is about. According to TKM, one local car-maker saw the Polo as such a potential threat it went to the rather extraordinary lengths of buying its own models and bringing them home for testing. Then again, with the Polo setting sales records across Europe, TKM’s Australian VW general manager Rod Williamson reckons it's no wonder a few companies have cause for concern. That quality means the Polo won’t be a ‘$14,990 drive away’ cellar-dwelling model; the entry-level five door version, boasting a good range of equipment including dual airbags, will start at around $21,000. And while that may sound like a lot for a 1.6 litre, four-cylinder hatch with 55 kW on tap — well, that's only because it is. Anything over $20,000 for a sub two-litre car is a fair ask, but the Polo really is – almost – as good as VW like to claim. In many areas it is the standard setter in the small car category, which, in many instances, shows up some of its rivals in a great number of key areas. It will compete against such vehicles as the Holden Barina and Ford Festiva, although most certainly it will drag in buyers who were looking at ‘larger’ small cars such as the Toyota Corolla. The Polo's big selling point will be its chic styling, a feature which will almost certainly see it become an immediate favourite with younger buyers and women. Initially it will be available only with a five speed manual transmission. The auto version, which uses VW’s high-tech four speed self-shifter with fuzzy logic, will not be arriving until 1997. One would imagine that as the Polo is aimed at lady buyers, the auto will lob sooner rather than later. The Polo has the looks and ability to not only make a few rival makes look rather like also-rans, but even the company's own Golf, now starting to show the signs of age, may suffer at the hands of VW's new kid on the block. Having tried the Polo in Germany, I can vouch for the overall dynamics and ability of thus compact but surprisingly roomy offering. It is nimble, well balanced and, despite not having a big amount of power on tap, very rapid. On Germany's speed unrestricted autobahns, the Polo 1.6 would wind itself up to 180 km/h plus. A little more power would be nice, mainly because the McPherson strut front suspension and torsion beam rear axle provides such a delightful balance, bet nevertheless it's a nicely tuned car. The 1.6 litre engine is sweet, revving smoothly and freely. Although TKM has yet to finalise the specifications of the Aussie model Polo, at $21,000 it is likely to come with most mod-cons including electric windows and mirrors, above-average stereo system and seat belt pre-tensioners. There is also an engine immobiliser. 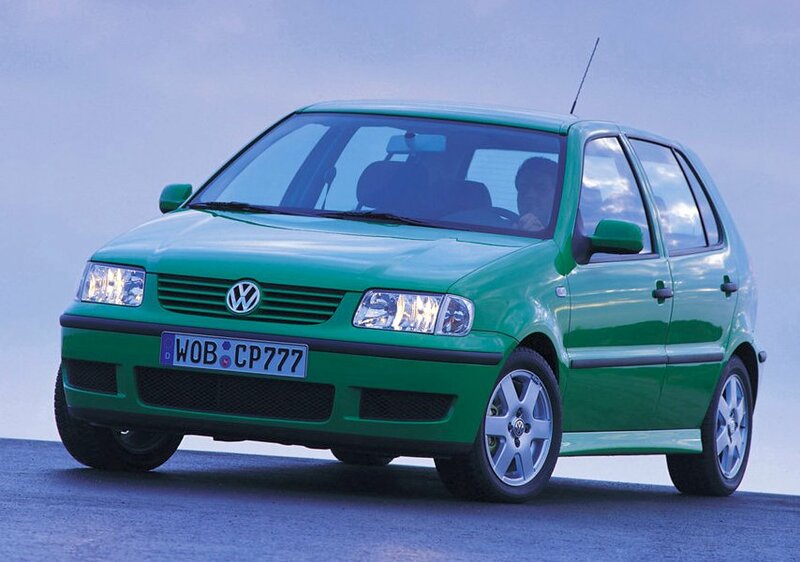 While VW will start with the Polo in five-door trim, it's almost certain an enthusiastic reception from buyers will see the company decide to introduce a cheaper three-door variant — possibly before the end of 1997. It's tiny on the outside, large on the inside, handles magnificently and is great fun to drive. With attributes like that, Volkswagen is no doubt feeling rather smug when it comes to the marketing potential of its latest baby hatch, the Polo. The first batch of 350 Polos landed in Australia last week, and if you find any of them still available, my tip is to grab one double quick. These little cars are so good that most of this first shipment have already been sold, and there'll be no more until the next ship docks in mid-January. German carmaker VW has achieved a rare coup in merging compact external dimensions with excellent interior space management. The front seats move up and down as well as fore and aft, providing a wide range of seating solutions for drivers of any size. It makes little difference whether you're diminutive or demonstrative, there'll still be plenty of space around you. The driving position is superb, regardless of one's stature, and access to the front bucket seats is easy thanks to wide-opening doors. The Polo, which forms the German company's front-line attack, sells in Australia for $19.990. At that price, the buyer takes home a five speed manual transmission matched to a 1.6 litre, four-cylinder petrol engine that develops 55 kW at 5200 rpm. Peak torque of 128 Nm is available between 2800 and 3400 rpm. For any hatch, the specification is impressive; the wide range of standard equipment includes power steering, central locking, power front windows, twin air bags, electrically heated and power adjustable mirrors and a CD player. The only option at this stage is air conditioning, with automatic transmission available from the end of January. I've recently put around 4000 km under the wheels of a Polo, and was totally impressed by the taut feel to its handling and its effortless cruising ability. While Australians will get just one version of the Polo for the time being, there's little doubt the product line will be expanded later this year. At the Polo's launch, VW Australia general manager Rod Williamson said he expected initial sales volumes to hit the 1000-unit a level during the Polo's first year on the local market. But already this prophecy looks somewhat understated; such is the appeal of this highly desirable hatch. Volkswagen looks set to offer more models in line with those available in Europe. Currently the German market has the choice of three-door and five door hatchbacks, as well as a four-door sedan. A Polo coupe is also available in Europe. While that little list will keep the private sector content, light commercial buyers will be able to choose the Caddy. This is a bubble-backed two-seater that Holden used as inspiration for its ‘Combo’ small van. The two look very similar, in fact, and it will be interesting to see if the two will compete on the Australian market. The manual Polo is fairly quick off the mark, and with a Cd factor of 0.32. Wind noise is kept to a minimum, even at high speed. TKM chose the 55 kW four cylinder for Australia, but in other markets there's a choice between a 1.0-litre; a 1.4-litre with a high performance, multi-valve head; a second 1.6-litre with more power; and a 1.9-litre, naturally aspirated, four-cylinder diesel. The 1.6-litre we get is agreeably swift, knocking off the dash to 100 km in just 12.5 seconds, and providing a theoretical top speed of 172 km/h. But its real advantage is its provision of a steady torque output over a wide rev range. This allows the engine to hold on to a gear without the driver being forced to reach for another cog in a hurry to maintain momentum. Even with its more than acceptable level of performance, the Polo is a pretty frugal performer when it comes to fuel consumption. This little front-wheel-drive wonder uses just 5.2 L/100km at a constant cruising speed of 60 km/h, increasing its thirst to 6.9 L/100 km when the speed is upped to a constant 120 km/h. In terms of overall fuel consumption, it's fair to expect an average of 7.0 L/100 km. The Polo runs on 13-inch wheels, fitted with 175-section tyres. Its front suspension employs a lower wishbone with MacPherson struts, while a V-section torsion beam positions the rear axle with the aid of trailing arms. Inchcape Distributors, the VW importers, haven't yet decided whether the new VW Lupo you see here will be sold here in Australia, and that's a pity. Sure, the weakness of our 'Pacific Peso' against the powerful DM is a factor over which even Piech's People in Wolfsburg have little control; although he's so powerful you'd think Piech himself could position the German currency wherever he'd like if he decided to. VW launched the Lupo at the Paris Motor Show in October this year, and it's a spunky little beast. Though it's an over-simplification, the Lupo is basically a cut-down Polo. As shown in Paris, it's powered by VW's new 1.4-litre 16-valve four, turning the car into a real Suzuki GTi alternative. 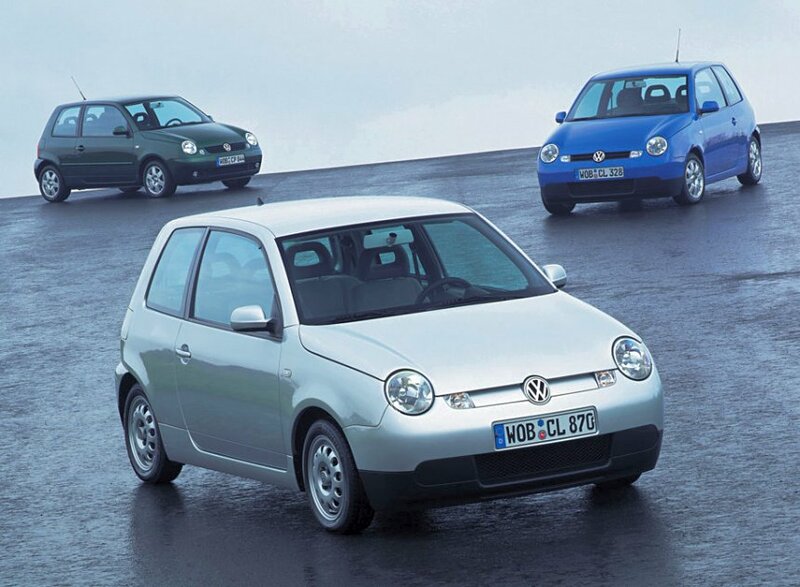 The Lupo is made in VW's main plant at Wolfsburg, and so it derives its name from the Latin word Lupus, meaning Wolf. To make a Lupo, start with a VW Polo and lop 77 mm out of the wheelbase, trim the rear overhang to almost nothing, and cover with a new skin to create a smick-looking three-door that spans a mere 3527 mm from bumper to bumper. That's nearly 200mm shorter than a Polo and 583mm shorter than a Superbug! With the 1.4-litre twin-cam engine and manual trans, the scales are tipped at 982kg. The new all-alloy 1.4 is an excellent piece of work, with 55 kW developed at 5000 rpm, and peak torque of 126 Nm coming on stream at a useable 3800 rpm. This is the same power output and only a little less torque than the current Polo 1.6-litre plant. It's a willing revver, and while not quite as sharp perhaps as the Suzuki GTi engine it gets the job done - and then some - in the Lupo. The gearchange is the best we've encountered in any VW for a long time, with short throws and a more precise than normal change in a front-driver. Handling's first-rate, with the steering exceptionally well balanced, offering plenty of communication with the driver. Turn-in is crisp - on that little wheelbase it ought to be - with the chassis tuned for crisp transient response. And while firm, it won't rattle your fillings out either. If only the Polo were this entertaining! There's a bit of bitsa about the Lupo's styling, almost as though the nose was styled by someone who didn't talk to the gang doing the back two-thirds of the car. Inasmuch as the Lupo started off as a Seat Arosa with a nose job and a new interior, this scenario mightn't be that too far-fetched. But we like the perky round headlights and blinkers up front. It's a distinctive look in a segment with a lot of ‘me-too’ cars. The instrument panel is equal to the nose, with a low crash pad curving down from the cowl, broken only by a pair of hoods for the instruments. The big crash pad deserves mention for having the balls to look like plastic, rather than a faux-leather finish. The pad has a cool pin-grain, which is pretending to be nothing other than plastic. Bravo Lupo! Also full marks for having the courage to show plenty of painted sheetmetal at the side. 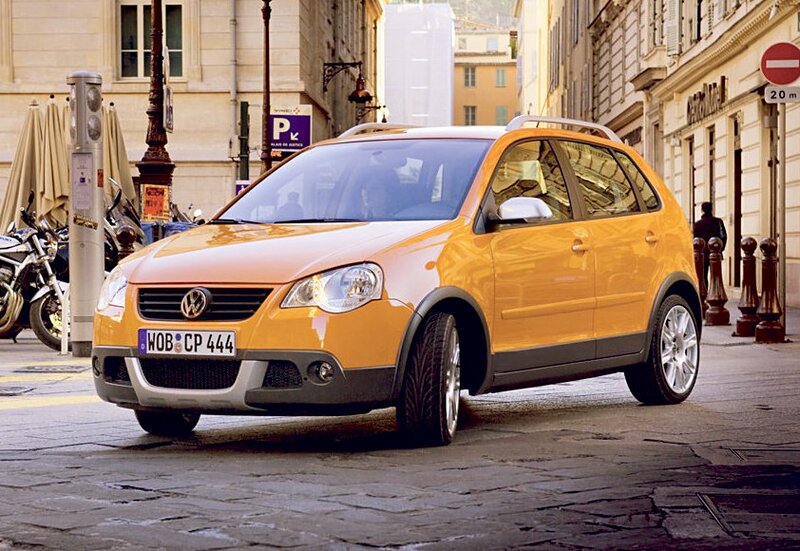 As mentioned previously, the Lupo's future is awfully dependent upon what happens to our beloved Aussie dollar. If Inchcape gets a ton of letters from us it might take a closer look at where the Lupo might fit in the local range (dump Seat and concentrate on VW! - Ed). We see the Lupo not as a sub-Polo entry, but rather for a focused Suzuki GTi alternative. We say "bring 'em on!" In a market where really small cars cost $14,990 drive-away, Volkswagen's move in 1996 to introduce a micro-car at a premium price seems like brave stuff indeed. 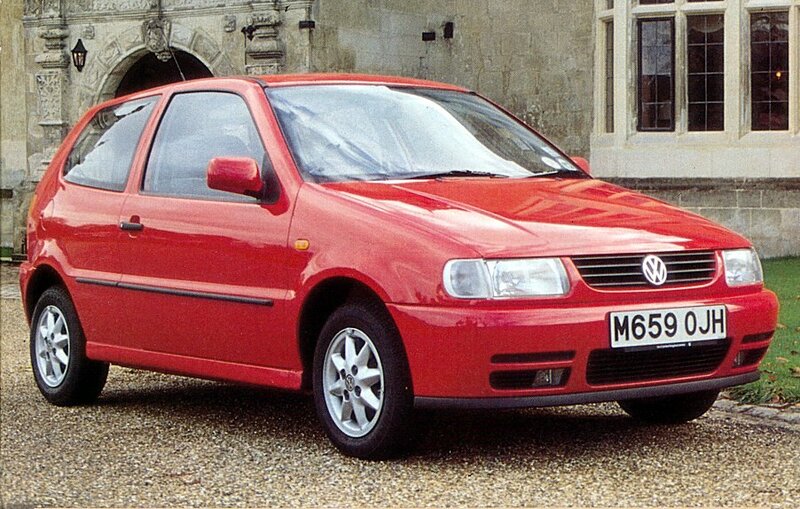 The Polo was the car, and if you thought a Golf was a small car, you really should check out a Polo. In exterior terms, it's about the size of the evergreen Peugeot 205, although it has to be said that the packaging is typically VW-intelligent and makes the most of the tiny exterior dimensions. But the price - at $19,990 on its launch - was anything but what buyers of that sized car were used to. Hyundai, Kia, Daewoo et al had really redefined that end of the market and paying any more than about $15,000 was decidedly unusual behaviour. What saved the Polo was that while it may have been roughly the same size as a Ford Festiva or Holden Barina, it was a proper car. At least, it was more of a car than the same-size opposition, so the price tag was justified for some buyers who wanted the European chic in a manageable package. While 20 grand might have sounded steep for something of the Polo's size, it's a pretty cheap way to get into a German import with the cachet of a Volkswagen. The differences between the Polo and some of its weight-division competitors are pretty obvious from the minute you line them up for a comparison. Basically, the Polo is made of sterner stuff. The doors are heavier, the metal feels thicker and while the quality of plastics inside is perhaps visually no better, our money's on the Polo to go the distance. That's not to say the model was without problems and some owners reported ratty carpet and a few air-conditioning woes to keep dealers honest. But paint quality was good, the panel fit consistent and overall the Polo seemed as if it was built by people who cared. 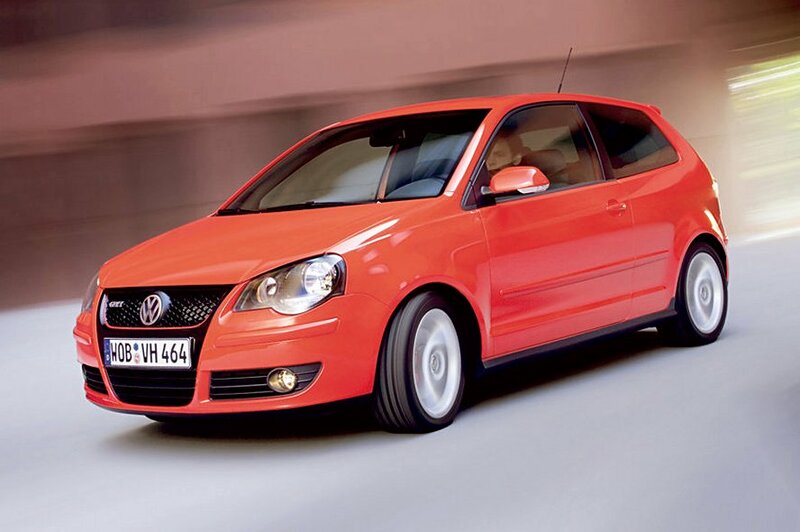 Perhaps the main advantage the Polo had over other micro cars was its dynamic abilities. Where a lot of really small cars struggle to find a compromise between ride quality and handling, the Polo had no such problem. Smaller, lighter cars might seem an easy thing to suspend, but at least as much work goes into suspension tuning as it does in bigger, heavier cars. The trick is to make the car handle -which is the easier bit, since there's so little unsprung weight or overhang and flab generally - but the hard part is ensuring the thing doesn't ride like a dray, since there's minimal weight to make the suspension work as it should. If it sounds like a black art, that's probably still partly true, but it remains a fact that the Volkswagen engineers got it right with the Polo. While the car was eager to turn into a corner and nimble at speed, that didn't come at the cost of ride plushness. In fact, the Polo rode like it was a size or two bigger, and that's always a compliment. The other big advantage the Polo had over the masses was under its stumpy bonnet. Like a lot of Euro makers, Volkswagen has never bothered itself with attaining a high horsepower figure for the sake of the sales brochures. Neither did it adopt technology for its own sake. 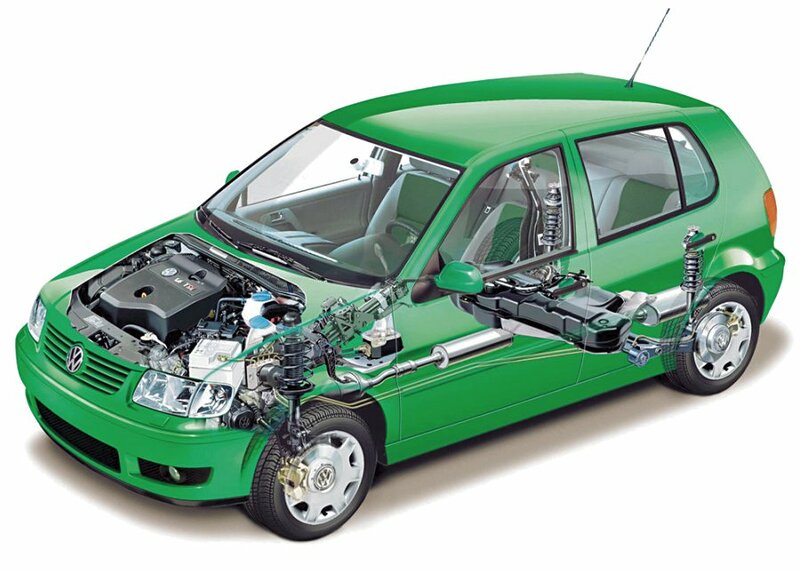 The Polo got electronic fuel injection, but stayed with a single overhead camshaft and just two valves per cylinder. So, while the Polo's 55 kW sounds a bit on the limp side, you need to remember that it was produced at just 5200rpm and not in some stratospheric rev range that need a race-track to explore properly. The engine was also tuned for torque rather than outright power, so it will trundle along at low revs and still accelerate well when you ask it to. That sort of flexibility is what we've come to expect from European makers and long may it continue. While the near-enough-to-$20K asking price seemed high at the time, when you look at the standard equipment list, the sticker starts to become more justified. While the $14,990 stuff was making do with a simple radio-cassette, wind-your-own windows, no central locking and generic grey plastic bumpers, the Polo was relatively loaded. As well as colour-coded bumpers, you also got central locking, better-than-average cloth trim, dual airbags, a CD player, power mirrors, power front windows and air-conditioning. You also got four doors when some of the cut-price boys were based on two-door bodies. All things considered, the Polo was good buying - despite what your reaction may have been when seeing the price tag for the first time - and a pretty good car into the bargain. Prices have held up pretty well thanks to the reputation the car has gained. Expect to part with $15,000 at a dealership for a '96 model with about 50,000km on board. Then again, a four-year-old Polo is still a better drive than some brand new stuff at new-car prices. Volkswagen has used the less-is-more philosophy with the updated Polo. Less, because it now comes with a smaller 1.4-litre engine, when the original model, which first appeared here in October 1996, had a 1.6-litre unit. More, because it comes with more standard features, but the downside is that the price has also increased, now pegged at $22,490 compared with $18,700 for the superseded model. To help sweeten the deal, VW has added, among other things, air-conditioning, sporty looking 15-inch alloy wheels, a cup-holder and floor mats. For a car priced in the low $20,000 bracket, it is well equipped, but then it probably needs to be. While the Polo comes with a small-car price, it is, in fact, a similar size to the cars from the light-car class, such as the Toyota Echo and Mazda 121. This translates into a back seat that is rather cramped, the boot is small and cabin width a little tight. Not that the interior is a bad place. The facelift has brought what is basically an all-new interior, with the old and rather dull dash replaced by a more modern and rather sporty looking affair that's dominated by the large ‘metal-edged’ speedo and tacho. As with other VWs, the interior materials are first class. Everything feels and looks right. The new dash brings more storage space, with a glovebox and cup-holder now part of the deal. But the interior fitout is not all good news, with the ventilation controls mounted too low for easy and quick use. The car we sampled came with the optional leather trim that adds a distinct air of luxury to a car in this class, but at $2,390 it is an expensive treat, even if this price includes seat heaters. The well-padded front seats proved to be both comfortable and supportive. The update of the Polo can only be described as significant (60 per cent of the components have been changed), as the nose and tail of the five-door hatch have been redesigned, giving the VW baby a more Golf-like (and upmarket) look. VW claims that the panel shut lines have been made smaller, which helps emphasise the car's new-found classy look and improves aerodynamics. A pity, then, that the test car generated a loud and annoying wind rustle on the centre B pillar just near the driver's ear. The engine may be smaller than before, but its saving grace is that it's a fresh, modern 16-valve unit developing 55 kW at 5000rpm and 126 Nm at 3800rpm when drinking premium unleaded. This compares with 55 kW at 5200rpm and 135 Nm at 2800rpm for the superseded eight-valve 1.6. Obviously this car is no rocket ship, but VW claims a respectable 0-100 km/h time of 12.3 seconds for the manual and a more leisurely 14.5 seconds for the automatic. Torque may be down, but mated to the slightly notchy manual gearbox, the new car is still quite agile around town. But it's the improvement in refinement that really helps. The new engine is far more eager to rev and it does with far less stress and noise. Having a more efficient engine under the bonnet has also improved fuel consumption, with the factory claiming that the manual uses 8 per cent less fuel in the city, while the four-speed automatic has cut its drinking bill by 9 per cent. Highway consumption has been reduced by 15 per cent and almost 10 per cent respectively. A wider front track and changes to the spring and damper rates have dialled-out much of the unwanted choppiness the old car displayed over bumps. An impressive improvement, given that this small car now rides on larger tyres (which generate a bit of tyre rumble). The wider front track has improved the car's handling, now turning in more progressively and faithfully than before. In many ways the Polo is a bit of an orphan in our market, priced in the small-car class but offering only an engine and body size more suited to the baby-car segment. However, it is not without appeal with its upmarket looks, good equipment levels and air of quality likely to appeal to those looking for something a bit different from the usual Japanese and Korean offerings. A Polo on steroids - that would the best description of the new Volkswagen Racing Polo Super 1600 rally car. Presented at the Essen Motorshow and based on the Polo 4, the car is equipped with a 1.6 litre engine that delivers 158 kW. The Polo Super 1600 also features a six-speed sport gearbox with sequential gearshift and the self-operating multi-plate differential. Designed for the FIA Junior World Rally Championship (JWRC) as well as national rally championships, the Polo must adhere to the FIA regulations, which dictates the car can cost no more than $100,000 US dollars. 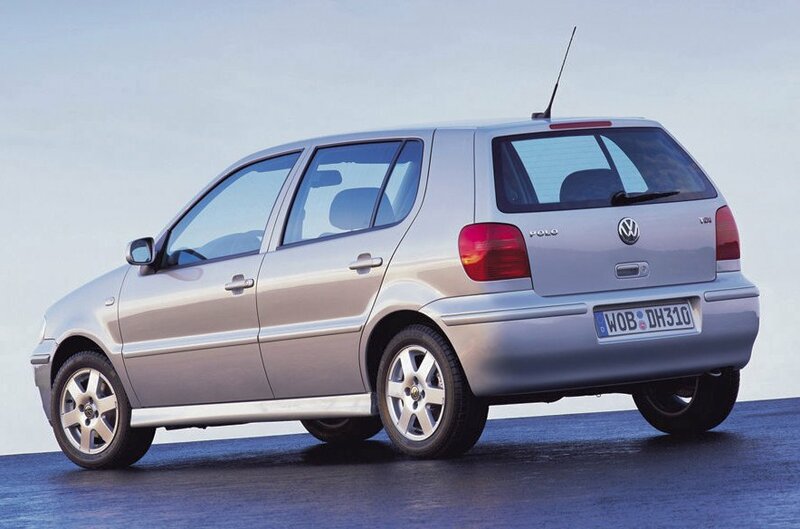 On July 1, 2002 the Super 1600 Polo is scheduled to be homologated with the Federation International de l'Automobile (FIA). Before the planned sales start of the Polo Super 1600, the Volkswagen Racing team will put the car through extensive development and test sessions. These will start at the end of February 2002. Threefold German rally champion Dieter Depping has been hired as a test driver. His experience with front-wheel-driven cars will be used by Volkswagen Racing in the development of the new Polo. During the test days, the focus will especially be on the development of the chassis for various types of surface. Furthermore, the engine development will focus on performance and reliability. The planned competition debut for the Polo Super 1600 is also FIA homologation day, July 1, 2002. 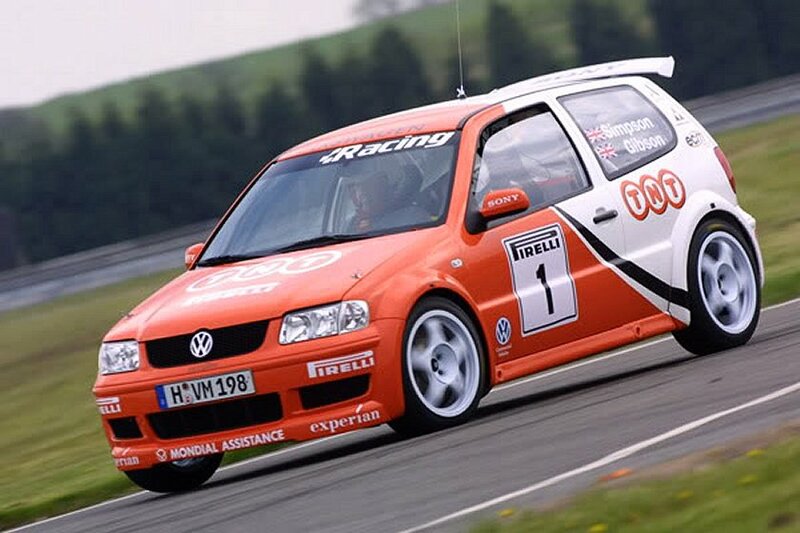 It is the goal of Volkswagen Racing's development team to provide a successful package with the Polo Super 1600 to interested privateer teams and talented junior drivers by the start of the 2003 season. The playing field for the Polo 4 is the FIA Junior World Rally Championship, as well as national rally championships. Designed to compete against fellow JWRC cars such as the Suzuki Ignis, Ford Puma and Peugeot 206 XS the Super 1600 Polo is a car that provides drivers with a stepping-stone to the World Rally Championship. The sequential gearbox and multi-plate differential are very similar to the gearboxes used in the WRC. The biggest differences between the JWRC cars and the WRC cars are that the WRC cars have turbocharged 2 litre engines producing (restricted) 225 kW and all wheel drive. The JWRC cars have 1600 cc of displacement and front wheel drive. In order to meet FIA regulations, the Polo Super 1600 will cost no more than US$100,000. The strict regulations focus is on providing complete cars and spare parts at reasonable prices, which will facilitate junior drivers looking to gain experience in top level rallying. Thus, materials such as carbon fibre, magnesium and titanium have been ruled out as parts constructed from these materials have proven to raise the price of competition. Since the JWRC is the direct feeder series to the World Rally Championship, the price caps implemented by the FIA allow junior drivers to compete in all rounds of the Junior World Rally Championship on a smaller budget than otherwise. The price caps also level the playing field between privateers and factory supported young drivers who are using JWRC as a stepping-stone to WRC. Until now Volkswagen's stylish Polo range has been the hippest European hatchback in Australia. Recently the Polo Classic 1.6 was ‘unhatched.’ Why unhatched? Because the all-new ‘Polo Classic 1.6’ is a sedan version of Europe's most successful compact car. Earlier generations of the VW Polo also had booted versions, but these were not sold in Australia. The first booted Polos of the 1970s were called the VW Derby. This name was dropped in 1983 and all subsequent booted Polos have been called Polo Classics. This is the first model to be sold in Australia. The new Polo Classic is a handy 280mm longer than the Polo hatchback, and boasts a 432-litre boot capacity. The sedan model includes the abundant safety and comfort features that make the Polo the standout European compact car, including dual front and side airbags, anti-theft alarm system, ABS anti-lock brakes, semi-automatic air-conditioning, and in-dash CD sound system. The Polo Classic is powered by Volkswagen's 1.6-litre engine developing 74 kW of power. The standard transmission is a 5-speed manual. Volkswagen's Polo Classic is very competitively priced for the Australian market, with a retail price of $23,990. Believe it or not, this is due to the car being manufactured in one of VW's modern Chinese plants. The VW Polo Classic becomes the first Chinese-made car, of any make, to be made available for sale in Australia. Sydney International Motor Show, 21st October 2005 - Volkswagen Group Australia introduces the latest ‘Hot Hatch’ to the local Volkswagen range, and confirms that Australia will be the first country in the world to sell the new Polo GTI. It is the first-ever world-market Volkswagen model to have its official world launch in Australia. The new Polo GTI with 110 kW of power is the most powerful Polo built throughout its thirty-year (30) history as a global model. This is also the first time a GTI version of the Polo has been offered in the Australian market, but given the phenomenal success of the recently released Golf GTI and the strong performance numbers and dynamics of the new Polo GTI, it is an obvious inclusion. As with the Golf GTI, the new Polo GTI uses turbo technology to power it. On board is a 1.8-litre, 20-valve, four cylinder turbo charged engine with intercooler producing 110 kW and 229 Nm of torque (from 1,950 rpm). Given the nimble nature of the new Polo GTI, it can therefore sprint from 0 to 100 km/h in 8.2 seconds and reach a top speed of 216 km/h. The fourth gear acceleration from 80 to 120 km/h takes a mere 7.5 seconds, given the strong torque of this engine. Exceptional handling dynamics are paramount for any Volkswagen to wear the GTI badge and the Polo GTI has these. The chassis has been given due focus and is 15mm lower than a standard Polo. The GTI is fitted with 205 / 45 / R 16 tyres on the unique GTI alloy wheels to ensure the sporty relationship is continued. At the same time, safety has not been substituted for performance. Active and passive standard safety features such as 6 airbags, Electronic Brake Pressure Distribution (EBD), Anti Lock Braking System (ABS) and Electronic Stability Program (ESP). A low tyre pressure indicator is also included. The exterior is distinctly GTI. With the honeycomb grill, dual headlights encased in black, dual chrome exhaust pipe and rear hatch mounted spoiler there is no mistaking the heritage of this car and the relationship it has to its bigger brother. The interior continues the theme with sports seats incorporating the special GTI checked Interlagos trim, leather sports steering wheel and gear knob, aluminium foot pedals and appropriately placed GTI branding on the seats and steering wheel. To enhance the unique sporty appeal, the new Polo GTI will be available as a 3 door with a 5 speed manual transmission only. Colours available are Flash Red, Black Magic, Shadow Blue, Reflex Silver and Candy White. Australian Volkswagen dealers are taking orders now, with the first vehicles arriving in late November. Priced from $26,990, the Polo GTI will appeal to drivers looking for an exciting performer with value in mind. The Polo Dune is wacky, crazy, off the wall. So say the Germans at the launch. We'll consider that later. Right now we're more concerned with keeping it out of a two-metre bank of snow. Because we're racing our Polo Dune around an ice course. How very wacky, crazy, off the wall. It's still not clear why Volkswagen chose to let us loose, high in the French Chastillon plateau, on a circular ice course in Polo Dunes. But, let it be said, we had an absolute riot. Judicious use of the handbrake had the five-door hatchback drifting sideways with glorious finesse, while standing on the bank afterwards, watching colleagues do the same, ranks highly in the tally of surreal-but-fun experiences. Of course, part of Volkswagen's thinking must have been to highlight the beefy, lifestyle aspects of the new model, underline that its tough body mouldings and raised suspension (actually derived from rough-road Brazilian-spec settings) are not completely just for show. Bumbling over frozen ice at 60 km/h certainly did that. Then the snow started again. The Germans were concerned as locals had told them how quickly, 2,000 metres above sea level, the area could become cut off. We were less worried; ice driving had given us supreme confidence, and besides the vivid orange of our test car couldn't fail to be spotted by the rescue helicopters. So it was back down the snaking, mountain road. On the way up we'd been in the 1.4-litre diesel model. With 53 kW and a climb that saw temperatures drop from 2 degrees to -9 degrees in just a few minutes, it was foot-to-the-floor all the way up, right arm a blur on the gearlever. The three-pot motor is willing and sounds delightful when revved, but it's not all-out fast, while the throbby nature at low revs won't please all. We had a 1.4-litre 16v for the trek down. Which, with the advantage of gravity, felt like a dragster in comparison. It's rather flat at low revs (for torque, go for the 8v variant) but has an almost VTEC-like kick over 3,000rpm, where it takes on a rorty nature that yielded more than enough speed for the icy conditions of the test route. That's speed enough for the Polo too; it's not a sports car, and the raised suspension seems to accentuate body roll through corners. It's an odd mix of lean coupled with grip, mind; soft suspension but 17-inch wheels and 215/40-section tyres mean it rarely slips, even if it's on the doorhandles. They also make the steering reasonably accurate and crisp. The steering contrasts with a soggy clutch and soft brakes that have too much travel. In contrast, the ride can be sharp, with those low-profile tyres picking out city scars sharply. The ride is surface-sensitive, too. However, excellent seats that feel 'large car' are good after long distances, and the maturity exuded by the car also eases journeys. It feels a cut above from the moment you slam the door and take in quality interior plastics. There's some garish-but-nice trims and neat detailing specific to the Dune too, while equipment levels for the UK will include climate control, CD player, fog lamps and side airbags. Then, so they should. Prices for the 1.4-litre 8v start at £12,645! That's a lot of money for what is essentially a jacked-up Polo with body mouldings and large alloys. ESP won't even be standard, so if you do venture off-road and become bogged down, there will be no electronic aids to help you out. It is more flexible than standard Polos, with a stout roof rack and the potential of specific accessories such as roof boxes and bike racks. The plastic mouldings also resist city scuffs too. But you can't escape the feeling that it's a styling exercise with no substance below - all show, for which you're paying dearly. Volkswagen UK won't even be offering the mad lime green and orange colours sold in Europe -meaning it will look a little too similar to any other five-door Polo. The ‘Dune’ theme is a trend that we're going to be seeing on other models in time, most notably the Golf. But even there, the available 4Motion system won't be used -VW admits these models are styling exercises, SUV-look models as opposed to variants with added flexibility or rough-road prowess. Will it work in the UK? The jury's out, particularly considering the prices VW is charging. We're more likely to take to the Polo GTI, which is much more up our street. It's not trying to be something it isn't and has greater heritage than the slightly naff Dune. It's a likeable car and, in orange or lime, with a lower list price, could become a bit of a cult car. But the UK backing is unlikely to be there and buyers are unlikely to warm to it, for the same reasons they failed to take to the Ford Fusion, Peugeot 1007, Citroen C3 XTR and Rover Streetwise. Charging more for something that lacks substance over style doesn't work. The standard Polo remains a first-rate supermini -this is a distraction we can't see buyers flocking to it in droves.